With a set of professional nail brushes, vibrant art is created in the salon. We offer brushes for precise techniques and detailed designs. In one set, the nail artist can have a gel brush, fan brush, detail brush and more. 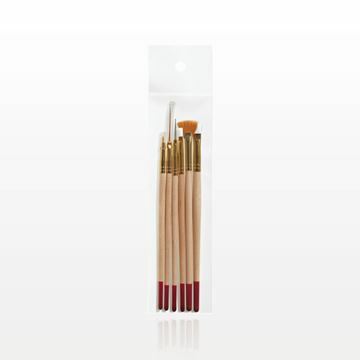 Our artistic quality brushes are well constructed and conveniently packaged for transport, storage and retail display. Each individual brush is designed to create specific effects during manicures and pedicures. With the proper brush in-hand, the artist applies polish, designs trendy patterns, or paints images, such as flowers. Use detail brushes to dot on colors or create swirls. A marbling tool can transform the dots into shapes. Create intriguing nail designs in the salon with ease using professional nail art brushes. In addition to brushes, Qosmedix showcases an extensive assortment of products for the manicure table, including nail implements, manicure bowls and nail polish remover wipes. 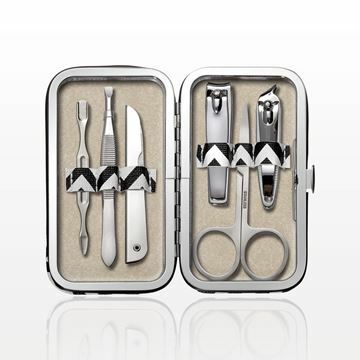 Stylish designs appear on nails in seconds with a wholesale nail brush set. 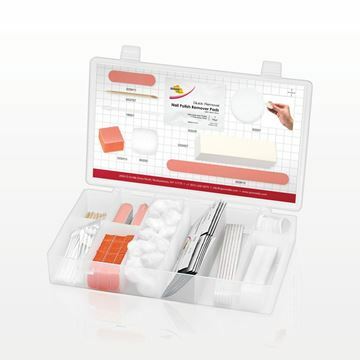 Our brush kit includes tools specially designed for the intricate painting of nails in the spa or salon. The brushes feature wooden handles, which are often preferred by nail artists. Synthetic fiber bristles provide artistic quality in the salon setting. A single brush kit for manicures can be ordered, although larger quantities qualify for brush handle customization – a business benefit. At Qosmedix, we’re committed to delivering a higher level of products and customer service every day to those in the salon and spa industries.